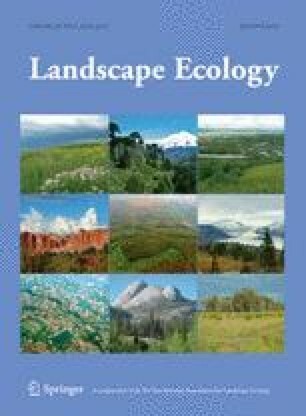 Forest ecosystems have been widely fragmented by human land use, inducing significant microclimatic and biological changes at the forest edge. If we are to rigorously assess the ecological impacts of habitat fragmentation, there is a need to effectively quantify the amount of edge habitat within a landscape, and to allow this to be modelled for individual species and processes. Edge effect may extend only a few metres or as far as several kilometres, depending on the species or process in question. Therefore, rather than attempting to quantify the amount of edge habitat by using a fixed, case-specific distance to distinguish between edge and core, the area of habitat within continuously-varying distances from the forest edge is of greater utility. We quantified the degree of fragmentation of forests in England, where forests cover 10 % of the land area. We calculated the distance from within the forest patches to the nearest edge (forest vs. non-forest) and other landscape indices, such as mean patch size, edge density and distance to the nearest neighbour. Of the total forest area, 37 % was within 30 m and 74 % within 100 m of the nearest edge. This highlights that, in fragmented landscapes, the habitats close to the edge form a considerable proportion of the total habitat area. We then show how these edge estimates can be combined with ecological response functions, to allow us to generate biologically meaningful estimates of the impacts of fragmentation at a landscape scale. The online version of this article (doi: 10.1007/s10980-014-0025-z) contains supplementary material, which is available to authorized users. The study was funded by the HSBC Climate Partnership Programme through the Earthwatch Institute.